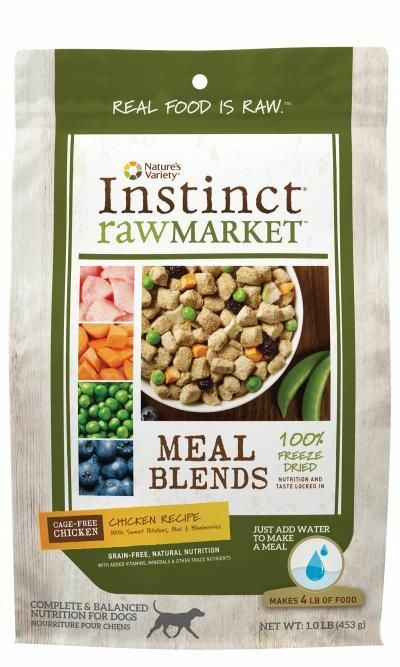 Carefully crafted in small batches, Instinct® Raw Market® Meal Blends are made from real foods you can trust, all 100% freeze dried to protect and lock in nutrition and taste. We’ve combined cage-free chicken with real, whole food ingredients like apples, peas, and blueberries for a nutrient-rich meal that your dog will love. It’s that simple. And we believe feeding your dog pure nutrition should be simple too. Chicken (including Ground Chicken Bone), Chicken Liver, Chicken Heart, Apples, Sweet Potatoes, Peas, Pumpkinseeds, Blueberries, Salmon Oil, Montmorillonite Clay, Organic Carrots, Organic Pears, Tricalcium Phosphate, Organic Butternut Squash, Potassium Chloride, Cod Liver Oil, Salt, Dried Kelp, Yeast Culture, Choline Chloride, Taurine, Organic Cranberries, Zinc Proteinate, Mixed Tocopherols, Vitamin E Supplement, Copper Proteinate, Rosemary Extract.